Over the past 5 months in Egypt we’ve witnessed the largest, and most sustained, outbreak of H5N1 among humans since the virus first emerged in China in 1996. While numbers are murky, we are somewhere in the vicinity of 160 confirmed cases since November 1st, and roughly 50 deaths. Or roughly 50% higher than the greatest previous one year combined total (for 9 countries) of 115 cases set back in 2006. Although we’ve seen a few small family clusters where H-2-H transmission may have occurred, we’ve seen no signs of increased human-to-human transmissibility of the H5N1 virus. But obviously something has changed in Egypt. Last January in a CIDRAP report (see FAO Reports Mutations In H5N1 Virus From Egyptian Poultry) we learned that genetic characterizations of H5N1 viruses sampled from Egyptian poultry recently showed signs of several troubling `mammalian adaptations’, and we’ve seen repeated reports of large numbers of poultry outbreaks – even among previously vaccinated poultry (see Egypt H5N1: Poultry Losses Climbing, Prices Up 25%). 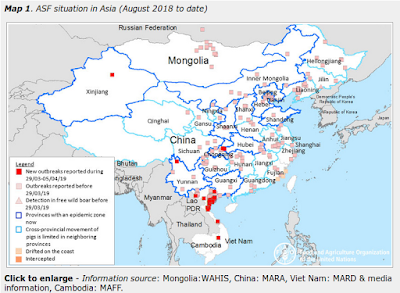 Yesterday the journal Eurosurveillance published a Rapid Communications characterizing the genetic changes in a rapidly spreading strain of H5N1 that appears to have emerged in early 2014, and is quickly supplanting other strains of the virus in that region. A distinct cluster of highly pathogenic avian influenza viruses of subtype A(H5N1) has been found to emerge within clade 2.2.1.2 in poultry in Egypt since summer 2014 and appears to have quickly become predominant. Viruses of this cluster may be associated with increased incidence of human influenza A(H5N1) infections in Egypt over the last months. In Egypt, highly pathogenic avian influenza (HPAI) influenza A(H5N1) viruses of clade 2.2.1 and their descendants have been circulating in poultry populations since 2006, causing sporadic human infections . Human influenza A(H5N1) infections in Egypt have been reported since the introduction of the virus in 2006 with 204 cases occurring until end of 2014 and a fatality rate of 35,8% in laboratory-confirmed cases reported to the World Health Organization (WHO). However, since January 2015, the incidence of human H5N1 cases in Egypt has increased dramatically: as of 21 March 2015, 116 human cases including 36 deaths have been reported to WHO . This study was initiated to analyse molecular properties of H5N1 viruses that have caused outbreaks in poultry in Egypt since summer 2014 and to compare them with published sequences from H5N1 viruses obtained from recent human cases. Our data confirm the emergence of an additional virus cluster within the Egyptian 2.2.1.2 clade of H5N1 HPAI viruses. Since November 2014, viruses of this new cluster appear to have become dominant over the previously described clade 2.2.1.2 phylotypes circulating in various poultry species. The only two publicly available sequences of viruses isolated from recent human H5N1 cases in Egypt show similar mutation patterns and fall into the same phylogenetic group. The molecular determinants that may improve the evolutionary fitness of these viruses need to be further clarified. The emergence of new clusters of H5N1 HPAI viruses in Egypt is not without precedence: In late 2007, a subclade of antigenic drift variants, later designated 2.2.1.1, emerged and expanded (clade 2.2.1.1a) in commercial poultry in Egypt but disappeared until end of 2010  and, contrary to the current situation, did not replace 2.2.1 viruses. Viruses of clade 2.2.1.1 that emerged in 2007 hardly caused any human cases: according to the OpenFlu database : only one of 100 H5N1 isolates from humans in Egypt belonged to clade 2.2.1.1; all others belonged to clade 2.2.1 and 2.2.1.2. In contrast, the emerging cluster identified in this study seems to be predominant across all poultry production sectors and has already caused a third of all human infections reported in Egypt since 2006 in only three months of 2015. Given the endemic status of influenza H5N1 in poultry and the limitations of the reporting system of H5N1 HPAI virus outbreaks in poultry in Egypt, it is difficult to assess whether the altered epidemiological pattern of the emerging phylotype is due to altered biological properties in poultry or whether the increased incidence of infections in poultry merely reflects an increased viral burden across all poultry sectors in Egypt. In any case, the observed recent rise in outbreaks in poultry probably resulted in increased exposure risks for humans in contact with poultry, which may have caused an increased incidence in human cases. However, it can at this point not be excluded with certainty that the emerging phylotype of viruses may have increased zoonotic potential and may be transmitted more efficiently to humans, although this assumption cannot be drawn from the molecular evidence described here. Further studies of the pathogenicity and transmissibility of these viruses in humans, e.g. in the ferret model, are required. Concerted efforts of both veterinary and public health authorities are urgently needed to interrupt virus circulation in poultry in Egypt efficiently. This will help decrease the risk of human exposure to the virus. While the exact impact of these changes on the transmissibility of H5N1 to humans isn’t certain, its rapid spread among Egyptian poultry has – at the very least – increased the odds of human exposure. While the future course of the H5N1 virus is uncertain, the more opportunities it gets to infect humans, the more chances it will have to adapt to our physiology. Add in the recent emergence of H5N8, H5N6, H5N3 in Asia and novel reassortants of H5N2 and H5N1 in North America, and it is hardly surprising that the World Health Organization recently released a pointed warning that H5 Is Currently The Most Obvious Avian Flu Threat.